3YOURMIND is presenting at formnext 2018, their product suite to bring customers further into Agile Manufacturing. In the process of “moving the world to Agile Manufacturing”, 3YOURMIND is announcing the launch of their latest product: Agile Manufacturing Execution System. It expands their end-to-end AM workflow from the part ordering platform production scheduling. Unlike other MES, this one was developed to manage the scheduling and prioritization of parts, and will significantly improve the digital management of AM Production. The initial features to be presented this November at formnext will be Smart Part Prioritization and Agile Production Scheduling. The most significant improvement for 3D service managers on the production floor is provided by the data based recommendation engine. When AM jobs are created, the system automatically suggests what part to assign and when to assign them. The company’s management have stated they already have an aggressive roadmap to develop the Agile MES even further based on the requirements of their customers, some of the biggest producers in Germany. “Our next priority is to create a strong direct connection from the Agile MES to individual machines. The collection of the real-time production data will further enable accurate production tracking and quality assurance.” says Stephan Kühr, Co-founder of 3YOURMIND GmbH. “We are determined to generate a fully integrated and automated platform that can serve as the data infrastructure for the Factory of the Future,” he adds. “We have very good experience in working with 3YOURMIND, and we trust in their capabilities to overachieve our ambitious goals. Therefore we are happy to announce the implementation of the Agile MES as a pilot version for our polymer benchmark production management solutions. As pioneers in the additive manufacturing (AM) industry, we strongly believe that only innovations will boost the adoption of the AM Technology. Especially integrated software solutions such as the one from 3YOURMIND are an underestimated growth driver. They can become a key enabler for a digital integration along the production chain. Our goal is to shape the future of manufacturing. We will achieve this by joining forces with complementary partners that share the same spirit of innovation, such as 3YOURMIND.” Güngör Kara, Chief Digital Officer at EOS. The Smart Part Prioritization is automatically generated from the incoming orders on the 3YOURMIND platform which speeds up the information flow and production decision making. 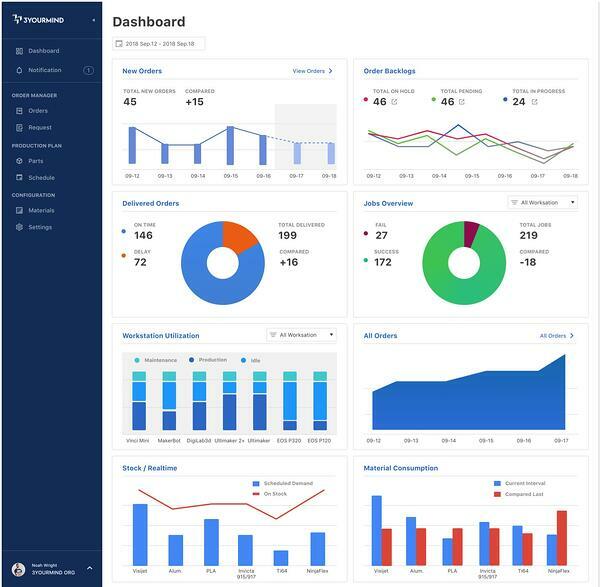 Keeping all order and part data submitted by the client in a single interface increases the transparency of the process, but more importantly, using the delivery dates and production specifications, the system classifies parts for jobs based on production priority and machine availability. This creates higher efficiency in resource management and machine utilization and keeps a better hold of delivery deadlines. 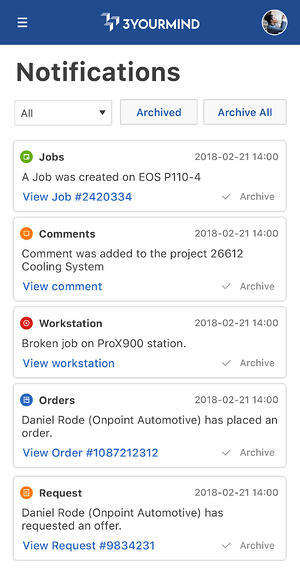 In the Agile Production Scheduling, Jobs are assigned based on Custom Workflows that define the specific production steps, post-processing and quality control requirements of each part. The engineers in charge of the production planning can schedule jobs based on machine capacities. The dynamic interface makes it easy to adjust production when new orders need to be added. Based on the planner’s nesting behavior, the software recommends which parts can be scheduled in one job. 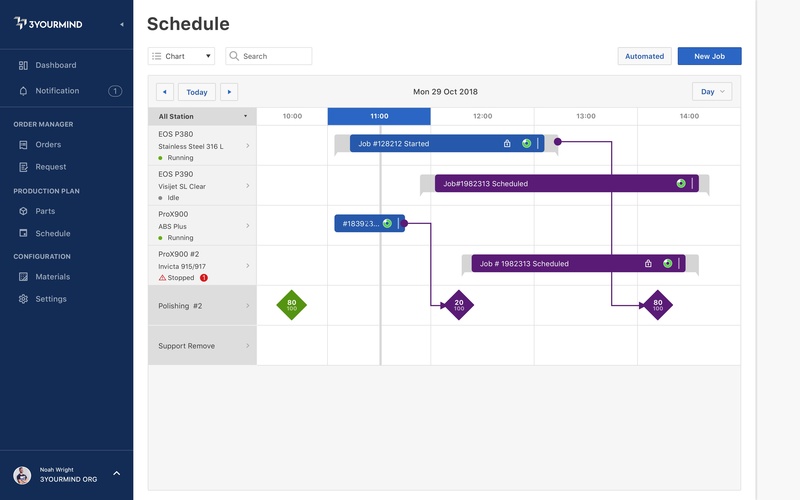 The Agile MES also gives the ability to reschedule failed production and manage maintenance with a single click. 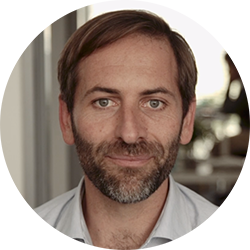 Daniel Burckhardt, MES Product Manager at 3YOURMIND will be available to discuss the MES roadmap status at formnext 2018 on their booth in the Hall 3.1 Booth G70, on Tuesday 13th November from 16:00.